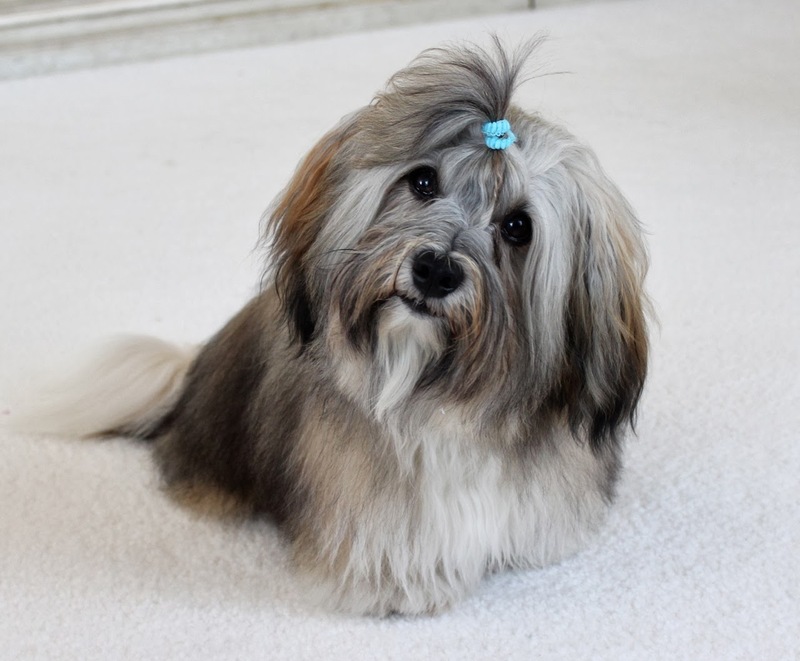 To Dog With Love: Time-saving Tips for Grooming Your Dog + Bobbi Panter Giveaway! Time-saving Tips for Grooming Your Dog + Bobbi Panter Giveaway! Folks often ask me if it takes a lot of time to groom Rocco. Keeping his long locks clean and tangle free does take a commitment. But along the way, I've learned some time-saving tips that also can save you money in the long run. A couple of the products we can't live without are Snarly Dog spray on detangler and Bad Hair Day dog shampoo and conditioner in one, both from Bobbi Panter. These products saved the day for us during a recent trip to Chicago, where Bobbi Panter is based and where I grew up! Rocco LOVES to play and he can get VERY messy! And there's nothing more fun than a romp on the Lake Michigan beach! Take a look at his before and after! Oh my! Can you imagine bringing that sandy mess into my mom's condo (and onto her nice white carpet) in Chicago? I brushed the excess sand off Rocco before going back inside and then used Snarly Dog to remove the knots and tangles. Even when Rocco isn't this big of a hot mess I use Snarly Dog! Rocco looking beautiful after a Bad Hair Day shampoo! I spray Snarly Dog lightly over Rocco before combing him out daily. And if we find a knot or tangle, I spray a little extra there to help remove the tangle without too much tugging and pulling. Snarly Dog adds sheen with macadamia oil and wheat protein. You can use it on wet or dry fur and it has a clean, fresh scent so you can use it with other products to keep your dog's coat soft, shiny and manageable! And, by keeping the mats at bay, you can save big on extra detangling fees that professional groomers will charge. Next, I bathed Rocco in Bad Hair Day dog shampoo. What's cool about this product is it's a shampoo and condition all in one, so you save time by bathing and conditioning in one step. It's also concentrated 16 to 1 so a 10-ounce bottle will go a long way. Bad Hair Day also helps smooth and detangle with ingredients like jojoba oil, vitamin E and aloe vera as well as a natural lactate that detangles, adds sheen and softens as it cleans. It has an appealing pear fragrance -- which for some reason smells like a cross between green apple and watermelon to me -- leaving Rocco silky soft and yummy smelling! All Bobbi Panter products are salt free and tear free and made with love in the USA. You can read more about Bobbi's story here. Grooming Tip: Spray Snarly Dog on your dog and use a COMB like this one from Chris Christensen to make sure you work through all the tangles BEFORE bathing. 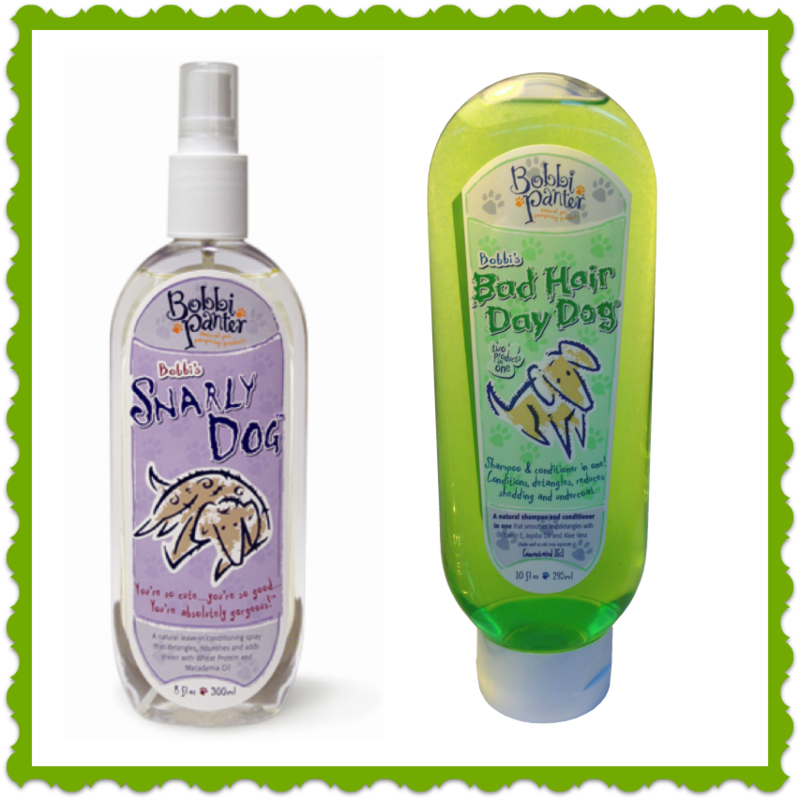 Win Snarly Dog detangler and Bad Hair Day shampoo! Enter via Giveaway Tools below for a chance to win an 8-ounce bottle of Snarly Dog AND 10-ounce bottle of Bad Hair Day shampoo. These are full-size bottles for a total prize package worth $38.00. Bobbi Panter is providing the product for giveaway. All views expressed herein are entirely our own. Ralphie isn't bad when I bathe him he likes when I dry him with a towel! Dot is not thrilled but not frantic when given a bath. She sort of sulks and resolves herself to getting wet. Then afterwards she is SUPER happy to be out and runs around and throws herself down on the towels! Mr. N grudgingly tolerates it. Onyxx tries to jump out of the sink. My girl loves to swim, but hates baths! I am going to have to check out the detangler, as my girl has long fur that does get occasional tangles and mats. Woa, do we need THIS! My poodle pup requires daily detangling and loves to get into messes! Rocco your before and after shots cracked us up. You look fabulous after your Spa Day. Have s wonderful Wednesday. I have 2 dogs. Sushi really loves taking a bath. She like all the massaging she gets while soaking in the tub, but Toby hates the bath. I have to talk her through the whole way. She is fairly indifferent. She does always seem glad when it's over though. I have five Treeing Walker Coonhounds and none of them really care much for being wet. They do okay in the bath, but all of them get out as quickly as they can when the bath is over. They do love feeling clean afterwards. Actually we take Dakota to be groomed, but I am BEYOND interested in the de-tangler spray for all of his Shetland Sheepdog fur! OMG can they ever get tangled! I get tangles sometimes and they are painful. I bet this would be great! I DREAD it...get it? Hhaha you have to go read my post to get it. I was referred by Dolly to the Doxie to come on over and win this! Bath time is "Sky the Pom" fun time to make mom chase her and then splash her. Detangling spray would make moms life much easier in getting those knots out and easier on Sky from pulling away. What an amazing transformation! You're lookin' good, Rocco. Shiloh hates bath time. I take him to a groomer I trust every 4-8 weeks and it's much better for both of us. He's so good, he'll let me do anything to him, but I always feel so bad when he gives me his "why are you doing this to me" look, so it's less stressful for me. And as soon as we leave the salon, Shiloh comes right down and loves our groomer, so it works for him too. I still brush him daily to reduce shedding and keep his coat healthy and matt-free, brush his teeth daily, and keep his nails trimmed. And in the summer, we go to the groomer less and do even more myself- I have a forced-air dryer to blow out his coat and occasionally will give him a bath outside if he really needs it (he really hates the tub). Would love to try the Snarly dog. Keeping him clean between baths is always a challenge- he's definitely a boy, and loves getting into things. And it's important to keep his long hair from getting tangled. We used to have a nice product for between-groom touch ups but they don't make it any more- we'll have to try this! I have two Boston's and neither one of them enjoy it. They will let me bathe them, but when I go to dry them its awful. I end up with water everywhere and two dogs getting my house all wet. My dogs hate bath time!!!! Sissy feels better in the bath now that I've gotten an attachment that has a little doggie massager on it. It works just perfect for her and has a sprayer too. My dog Chaos is such a good girl. She just sits there and waits to be done. My dog likes the bath once hes in it, but getting him there is a task. Melvin does pretty good with it.. Obviously it's not his favorite thing to do, but he tolerates it! He does not like it but he is a good boy and sits still until we are done! Thanks for the giveaway! I have one dog that loves bath time and one that hates it! My older dog doesn't mind bath time, my younger one whines and shivers the whole time. My older dog also LOVES to shake the water off....drenching me and the entire bathroom. Fun contest! Since my dog is black and has very short hair I hardly groom him at all. He swims a lot and I honestly haven't bathed him since July. Gross! Our Lab loves the water and actually loves to take a shower. All three see it as a necessary evil. They won't go in the tub on their own but will if I lead them to, and they don't shake/try to jump/fight me the whole time but just kind of stand there looking dejected. The one thing they do enjoy is me massaging shampoo into their fur! Barley tolerates bath time. She prefers getting muddy :) But I think she does like it when her whites are white again! Artie loves the water so bath time is not a problem, but Kouga hates it. Mine loves it. He is so relaxed and calm during bath time! she doesnt like it at all!! My dogs don't mind having a bath, they kind of enjoy being combed out and dried, they are so proud when they are finished. Oh boy, all my dogs hate bath time. They hide under the bed lol. My dog is pretty good at bathtime..I am lucky! My dog hates water: rain, wet grass... Bath time is not much fun at our house. Our little poodle mix doesn't like it very much, but she is still pretty good about it. Our pekingese mix seems to enjoy it a little more. I don't think either one of them like the blow dryer much though. our pup loves bath time. Wow. Really tips and helpful to anyone. I really enjoyed your post.